Today marks a homecoming, of sorts, for Tech junior A-Back J.J. Green who, as a true freshman at Georgia in 2013, ranked second on the Bulldogs in rushing (386 yards) and first in kickoff returns. For this season, Green entered today’s contest first on the Jackets in kickoff returns with nearly a 25-yard average. 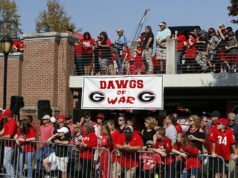 The line closed at kickoff with Georgia being a 5-point favorite, marking the seventh consecutive game in the series the Bulldogs were established as the favorite, and the 14th time out of their last 15 meetings. 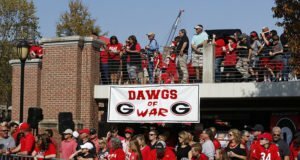 In contrast, in 13 games between Georgia and Georgia Tech from 1951 through 1963, the Bulldogs were favored just once (1960). In the first half, Sony Michel rushed for 117 yards and a touchdown on 12 carries. After rushing for 149 yards and a touchdown on 24 rushes last season at Tech, Michel has gained 266 yards on 36 carries during the last six quarters of play against the Jackets, while scoring two of the Bulldogs’ three touchdowns. Nick Chubb rushed for 58 hard-earned yards on 13 carries in the first half. He needs just 42 yards to reach the 1,000-yard mark for the season, whereby he would become just the third Bulldog in history to have multiple 1,000-yard rushing seasons (joining Knowshon Moreno and Herschel Walker). 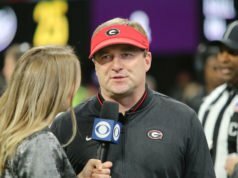 Georgia Tech entered the game with the fifth-worst third-down conversion defense (50.0 percent) in the FBS; Georgia converted 5 of 7 third downs in the first half. Tech’s offense ran just 19 plays in the first half, but totaled a staggering 201 yards. 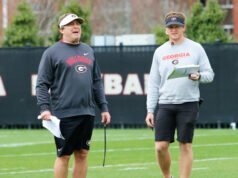 After allowing Auburn to average just over three yards per play two weeks ago, the Georgia defense has now allowed an average of 7.5 yards per play in its last six quarters, resulting versus Louisiana-Lafayette and Georgia Tech. In the first half, the Jackets passed for 86 yards. 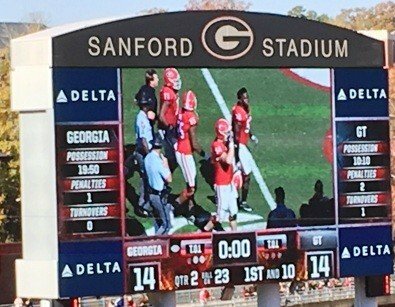 In the 2014 and 2015 games combined against the Bulldogs, Tech threw for only 146 yards. After making 10 consecutive field goals over a six-game span, placekicker Rodrigo Blankenship, who missed a 42-yard field goal in the first quarter, has made just one of his last three field-goal attempts over the last three games.